What Makes an Electrician Website Light Up? While you might not think there are special requirements for an effective electrician website, experience has taught us something different. The electricians and electrical contractors we work with get more from their pages and online marketing campaigns because we wire them for real-world results. In other words, we don’t just put their picture and phone number online; we give them an electrician website that can help them book more customers without blowing a fuse in their marketing budgets. If you have any special qualifications, be sure to display those prominently on your electrician website. The same goes for any specific types of projects you are well-suited for. You may even want to give a few details about jobs you don’t take, since that can save you time by weeding out unnecessary phone calls. Unless you happen to be the kind of electrician who works with any type of project, make sure your website spells out what you’re best at and which jobs you’d rather not handle. Where are you located, and what parts of your city or region do you serve? The answers to these questions should be spelled out as clearly as possible on your website, and then backed up with office addresses, maps, and other geographical details. This is partly because you want potential customers to be able to figure out whether you’ll come to their home or business or not. It’s also because you want Google’s software to display your business in local search listings for areas that are appropriate. Trinity Electrical and Radon Mitigation takes advantage of our professional geographic target marketing pages. The bigger an electrical issue or repair, the more important it is for a homeowner or business owner to know they are hiring someone they can trust. That’s why your electrician website should feature quotes from satisfied customers saying great things about your work. In order to build trust with customers, you should make these easy to verify. Use full names and photos of your customers if you have permission. Better yet, include links to third-party review websites like Angie’s List or Yelp. Customers are used to checking these out and will give more credibility to feedback they see on an independent forum. If you offer any guarantees about the quality of your work, be sure they are easy to see on your electrician website. Everyone likes to know they won’t have to worry about subsequent repairs or equipment replacements after a contractor has finished working on their home or business. Additionally, you might want to include any awards or certifications you’ve gotten from the Better Business Bureau or an industry group. You could even post background checks or screening details. These can make customers feel better about letting you walk into their homes and offices. 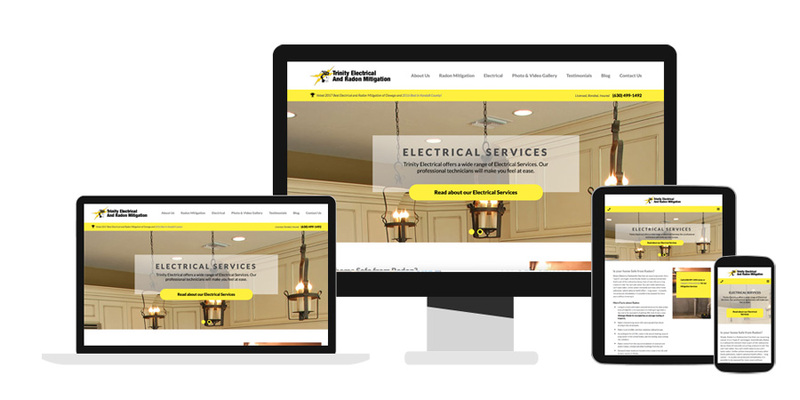 Need a Website for Your Electrical Contracting Business? At Weblinx, we help our customers to get great websites at affordable rates. Call our creative team at 630-551-0334 x1 today to set up a free consultation and see how we can help your business grow!